The Palaeontological-Archaeozoological collections represent hundreds of sites representing the history of the fauna from the Triassic to the Holocene of Israel. New sites are explored constantly while new excavations throughout Israel are taking place and their bone material is being analyzed and added to the collections. The Palaeontology collections hold an impressive body of information on the fossil records of the eastern Mediterranean, its biogeographic origin, its evolution and implicitly, all the available information about the ancient climatic conditions of the area. The collection was started in the late 1920’s by Y.L. Picard, founder of the Department of Geology, Y. Bentor and M. Avnimelech, who collected fossils in Israel and abroad including from “type-localities’. The collection also includes material collected since the end of the 19thcentury from different sites in the Middle East by Blanckenhorn, Conard and others. Prof. Paul Oppenheim from Berlin donated his collection of specimens from all over Europe in the 1930’s. The collection contains fossils of fish, amphibians, reptiles, birds and mammals from all over Israel and adjacent countries, representing the entire record of the area. It was founded by Prof. G. Haas and was later expanded by Prof. E. Tchernov. Fossil material from geological localities has been collected for more than fifty years. Bone bearing beds sites have been excavated and studied with world specialists. For example the Maktesh Ramon site, dating from the Triassic period, yielded thousands of remains of marine and terrestrial vetebrates. Type specimens of fossil fish species described by Dr. Yael Chalifa from the Hebrew University Palaeontological Collection are listed in Haasiana 4: 63-64. A world-famous paleontological collection is that of early Upper Cretaceous fossils from `Ein Yabrud (north of Jerusalem). This collection yields a wealth of rare primitive crustacean, mollusks and echinoderms, as well as rare forms of holosteans and teleosteans. One of the most remarkable fossil finds of recent years is the well-preserved remnant of three different genera of early snakes. Phylogenetically, these fossils appeared in the geological time scheme very close to origin of snakes. Thus, the fossil snakes of ‘Ein Yabrud possibly elucidate some unknown early steps in the evolution of Ophidia. 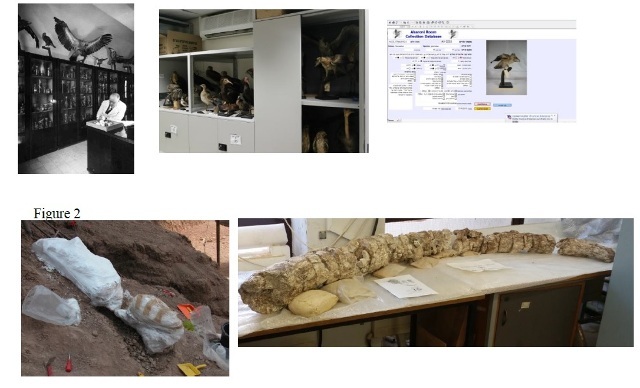 # Direct treatment of objects and collections including in situ conservation work on palaeontological, archaeozoological and (recent) zoological specimens. For example, the conservation of elephant skeletal parts from the site of Erq el Ahmar (2-1.5 million years ago). The findings were treated in-situ during excavation, and further conserved in the palaeontology laboratory until ready for research and future display similar to specimens from Revadim (Beiner et al., 2013). # Preventive conservation issues, such as environmental monitoring, storage improvement and maintenance policies. The new housing and storage facilities of “The Israel Aharoni collection of bird” are an example of storage and documentation improvements. All specimens are going through conservation treatment, are documented and digitize establishing a new database. # Research to improve conservation methodologies in natural collections (i.e. Beiner et al., 2015). We finished the 3rd season of excavations at EEA!